They say that one of the most exciting phrases to hear in science is not “eureka!” but “that’s funny,” and the Apollo 17 astronauts, just over 43 years ago, certainly got such a moment when they discovered orange soil just beneath the grey regiolith. What turned out to be volcanic glass with tin inclusions had another surprise: olivine deposits that showed signs that they contained significant amounts of water inclusions when they were baked, at about ~1200 parts-per-million. This matches the water levels in Earth’s upper mantle along ocean ridges, providing further evidence for the giant impact hypothesis and a common origin for the Earth and Moon. The “Orange soil” and meteorite impact on liquid lava differs greatly from ordinary lunar soils. 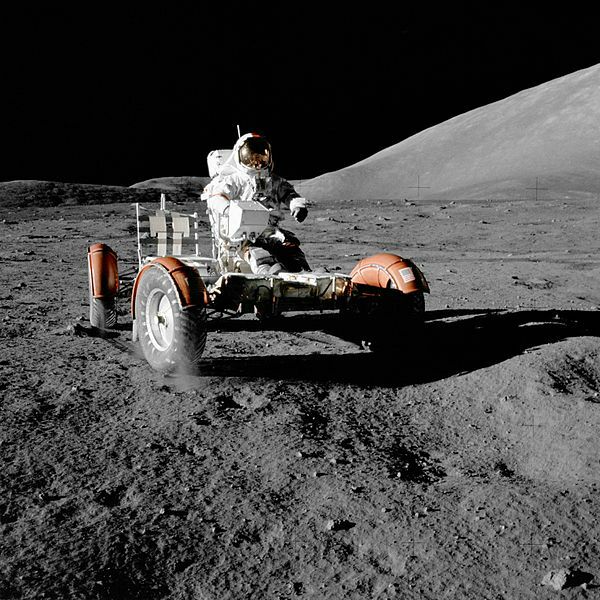 Station 4, also known as Shorty Crater (picture), is the site where the Apollo 17 crew found the highly-publicized orange soil. The site was explored during the second Apollo 17 extravehicular activity (EVA-2) at the Taurus-Littrow landing site. 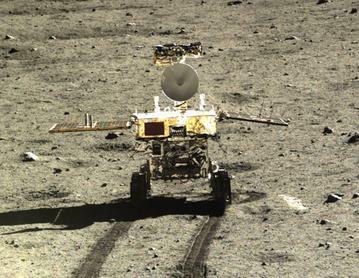 Danny Lewis of smithsonian.com wrote that the Yutu Rover has discovered a type of basalt unlike anything else ever found on the moon.